What does it take to help patients change behavior? So I’ve been teaching some basic principles of behavior change and coaching in three presentations, with four more to come, and I thought it time to share. 1. 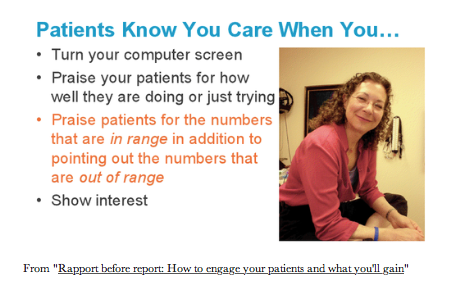 “Rapport before report”: This first presentation is about seeing the patient in front of you, not just their numbers. 2. “Why patients don’t change behavior and what you can do” : In my second presentation I discuss whether patients have the correct information? Do they understand what to do? Do they have the skills they need? And does fear stop them? 3. “Three more reasons why patients don’t change behavior and what you can do”: In this presentation I talk about the importance of patients choosing the behavior they’ll change, whether their motivation not to change is greater than their motivation to change and does their environment support the change? And there’s a last reason: Do you as a health care provider model the change? Unfortunately we know most doctors today will treat more patients with chronic illness than acute, and most doctors are not trained how to do so. I’m honored to have the opportunity to address all those who help to keep us well. To view the presentations, you’ll be prompted to register on QuantiaMD, but it’s free and the presentations are each about six minutes long. So pour yourself a cup of tea, pull up a chair and open your mind to the possibilities of doing a few little things that can deliver powerful results.